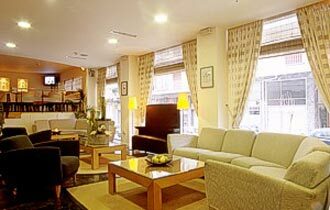 Conveniently located in the vicinity of the "Sacred Rock" of Parthenon and the historic district of Plaka, the exquisitely decorated and elegantly furnished Acropolis Select Hotel is within a short walk from the exciting shopping and vibrant nightlife areas in the heart of Athens. The spacious 72 guest rooms were recently refurbished and renovated to meet EU standards. Amenities include sound-proof double glazing, individual climate control, private full bathroom, direct dial digital phones, hairdryers, fully stacked mini bars, satellite TV, Pay TV channels, fire detectors safety boxes. The "Parthenon Restaurant" offers a complete American buffet breakfast and a-la-carte international dishes for lunch and dinner, while the "Zeus" bar stays open through midnight serving a variety of local and international drinks. Dry cleaning and baby sitting (upon request), fax, photocopy and exchange services, as well as free hotel parking and the use of an icemaker machine are also available. Acropolis Select Hotel has a conference room, which accommodates from 25 to 60 people, featuring individual sound and air-conditioning systems, overhead projector, flip chart and a large projection screen.